In the push-back over the Facebook privacy scandal, many are also asking questions about the data other platforms have. Many commentators draw a parallel to Google. For my part, this is valid at least as far as tracking, visiting locations etc. goes. Since I have a Google Phone, with a Google Fi service, and I use Google Maps, I pretty much expect them to track me. In addition, in my prior home I had Google Fiber, plus add in all the Youtube videos, if you watch movies or listen to music on Google Play; they have my calendar; all my files in Google Drive; as much as I try not to have my photos in the cloud, they’ve almost certainly got some of them in Google Photos. I typically avoid using Google Search directly, as for the most part, my search history seems a definitive list of things I’m interested in, but it’s much more subjective than that. I prefer startpage for search. I don’t read ebooks, but they’d have them if I did; of course I use a few Google Groups; and so on. So, it’s a pretty exhaustive list. 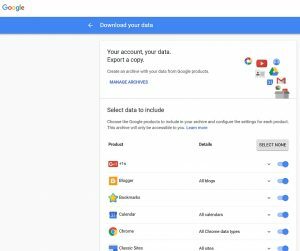 You do need to take care if you decide to download your Google information from google.com/takeout – It can get pretty big, pretty quickly if you’ve purchased books, films, music and make extensive use of drive, in addition to all the metadata, you’ll also get all the content. Despite all this, I feel like Google have not crossed the trust boundary. They may be using and aggregating all this data to sell to advertisers, but it’s not all clear how. It certainly isn’t obvious from the adverts. So for now, I trust Google to “Don’t be evil“.